In the last few decades, it has become increasingly evident that conservation, our own health, and the health of wild and domestic animals are all inextricably linked. A single pathogen can wipe out the last populations of an endangered species and, in turn, threaten the stability of local human populations. Thus there is an urgent need to simultaneously address the health of people and animals, recognizing that disease poses challenges to both conservation of the planet's biodiversity and efforts to improve the quality of human life. Ensure the health of wildlife species around the globe and in our New York zoological parks. Since our founding in 1895, WCS has harnessed our veterinary expertise to save wildlife and wild places around the globe. From intensively caring for endangered animals at our New York City zoos and aquarium, to aiding rural communities with livestock health, to monitoring the health status of elusive gorillas in the wild, WCS veterinarians, epidemiologists, and other health science professionals collectively represent an unparalleled constellation of capabilities. Build local capacity to care for and protect the health of wildlife worldwide. Gather and applying critically needed information to protect the health of wildlife, people, and domestic animals, all as underpinned by environmental stewardship. Promote policies, guidelines, and best practices to ensure a healthy planet. 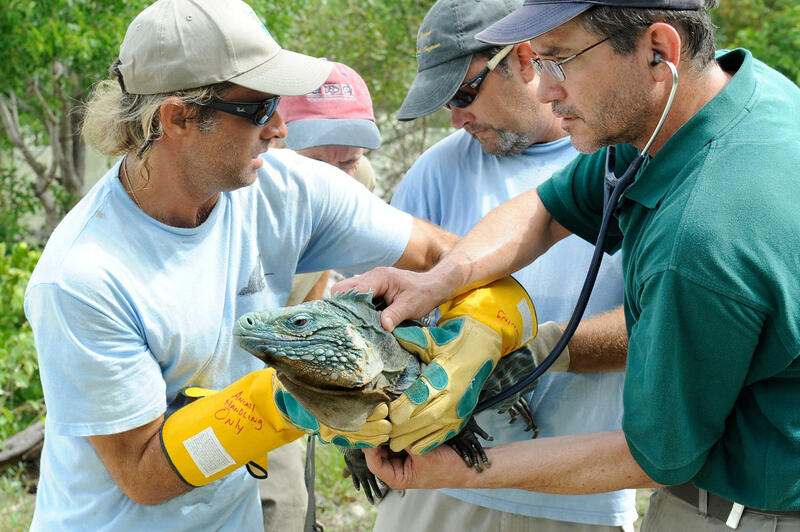 WCS has been the pioneer in promoting wildlife health as critical to saving wildlife and wild places. We develop and implement solutions that achieve long-term conservation success and create a healthier world. By engaging partners across conservation, public health, agriculture, and beyond, we provide critical information that influences policy and action. WCS initiated and remains a leader in the One World – One Health™ interdisciplinary approach. WCS has more than 100 years of hands-on veterinary work, disease surveillance, and groundbreaking scientific research to its name. The last known female Giant Yangtze Soft Shell Turtle (Rafetus swinhoei) died on Saturday, April 13, 2019, during recovery from anesthesia after an artificial insemination procedure in Suzhou, China. Over the past decade, portable technologies, including miniature sequencing and DNA detection tools, have been developed that have great potential in the fight against wildlife crime.